New Delhi: Targeting young professionals, BlackBerry launched its mid-range smartphone Z3 in India for Rs 15,990 with a feature that supports Hindi and Hinglish predictive typing. It is the first smartphone after the Canadian handset maker's partnership with mobile components maker Foxconn, and has BlackBerry 10 operating system (OS) with version 10.2.1. "Z3 is the first smartphone to be introduced from our strategic partnership with Foxconn and it further strengthens our commitment to enhance our devices portfolio," BlackBerry India Managing Director Sunil Lalvani said at the launch. It is available for pre-booking with Flipkart, The MobileStore and all BlackBerry Exclusive stores from today till to July 2. It will hit retail stores from July 2. Featuring a 5-inch QHD display, Z3 is powered by 1.2 GHz Qualcomm Snapdragon 400 dual-core processor with 1.5 GB RAM, and has 8 GB internal storage that can be expanded up to 32 GB using a microSD card. The handset features BlackBerry Maps, which provides 2D maps, local search and powerful 3D voice guided turn-by-turn directions. 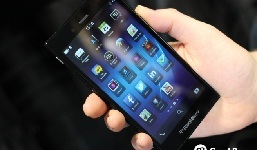 The company said BlackBerry 10 browser is incredibly fast with fluid and responsive scrolling and zooming. It includes many advanced features and supports multiple tabs. "BlackBerry Z3 learns how you share and who you share with, helping you reduce the number of steps and amount of time it takes to get your files, photos, or documents to where they need to go," Lalvani said. Popular especially among the youth for its Curve range of devices and messaging app BBM, India was a strong market for the Waterloo-based firm. It had a 12.1 per cent share of the smartphone market during January-June 2012 period. However, the firm saw its share fall as devices powered by Google's Android OS and Apple iPhones gained strong traction in the market and despite launching its BlackBerry 10 OS, it has so far failed to re-gain foothold in the market. During the March-May quarter, the company sold about 1.6 million BlackBerry smartphones compared with about 1.3 million in the previous quarter.